I’m gardening all hours of the day and evening getting ready for the Ferryside Garden Crawl on Sunday 24th June in aid of the Ferryside Lifeboat – please do come along 1pm – 6pm. We are on the Cliff with three other gardens – 30 places around the village to visit in all! 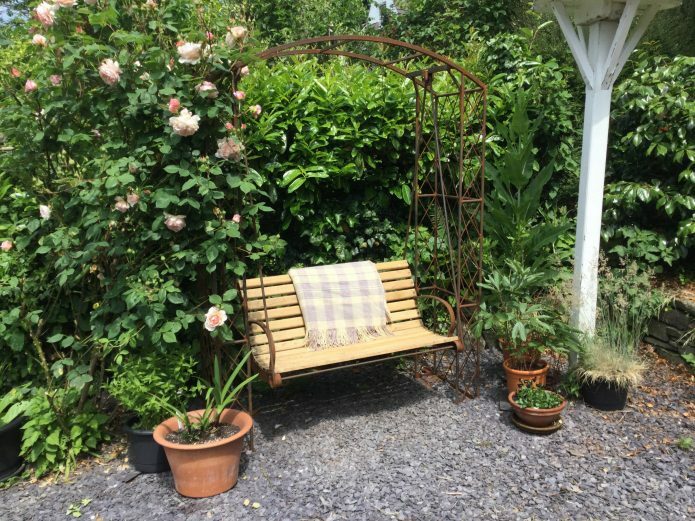 Below is my new old looking garden swing complete with rust and oak seat (by John Millross of Estuary Forge – Ferryside) which is very diverting. William Morris rose by David Austin is very thankful to have it to bloom upon.